How old would she be? I recently saw a very cool photo on the Standup Journal Facebook page. It was “Mom Feet,” Fran – mother of Standup Journal Publisher Clay Feeter. Meet the team here and remember, “The rest of the team is US!” Cool as a cucumber and smiling broadly, Fran looked totally at home paddling at age 82 – and why not? As she says, “Attitude is everything! I still feel like a kid (except for the joints!). I have on my refrigerator a quote from Satchel Paige: ‘How old would you be if you didn’t know how old you was?’ ” Right on! In the collection of photos (above) it’s hard to miss the smiles all around. No wonder. You’ve been to the beach where 90% of the crowd takes the beach towel/beach chair route for the day. After a spin on the sea it’s hard not to grin. 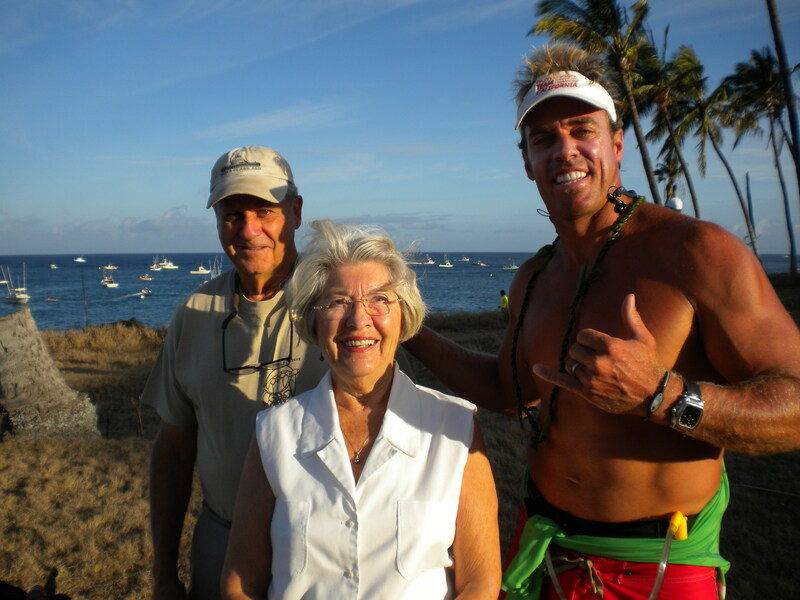 During the pre-2011 Battle of the Paddle festivities on Molokai Fran enjoyed some time with the competitors – and with Chuck Patterson whose grin voltage is in the Fran range! Fran decided to test out a Naish race board. Really, it’s commonplace for “grandma” to return home from errands, like the grocery store, and ask for help carrying in those heavy groceries. 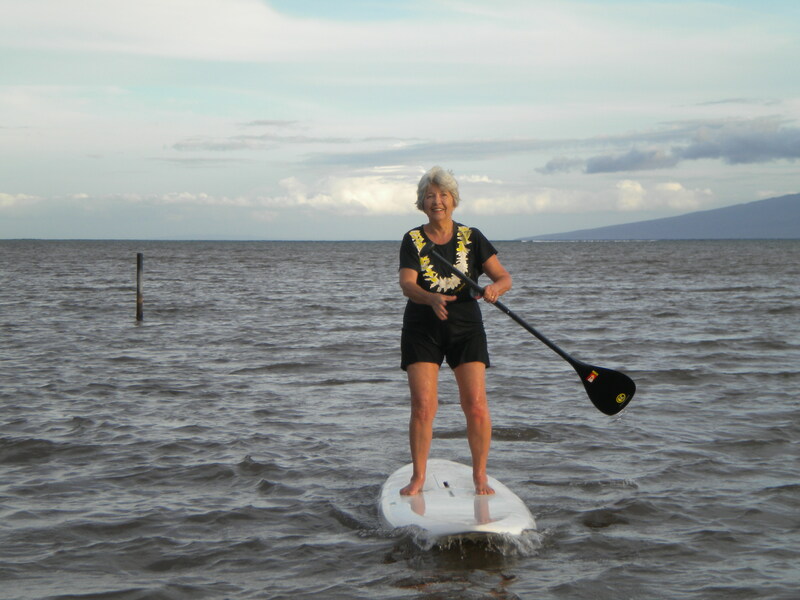 With the confidence and strength from a lifetime of sailing, windsurfing and paddling, Fran easily carried her own board to and from the water, like the true waterwoman she is. “When we moved here in 1991, we kept our sails rigged and hanging in the carport, so we could just grab them and go when the wind and tide was right (we have a fringing reef – the only one in the U.S. – just offshore, so need a foot of tide to clear it). We actually stopped windsurfing about 10 – 12 years ago. 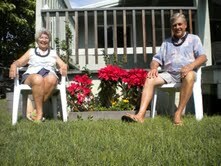 We both had knee problems (I had to drop out of hula). Knee replacement has solved that problem, but we had gotten out of the habit of windsurfing. ” True to “that’s the way Fran does it,” she stays active with the hula group helping with costumes these days. By the way, check out the paddle Fran sports as she’s cruising the crystal clear waters of her favorite inner lagoon these days. 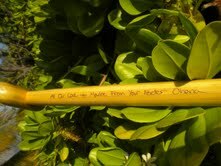 The custom and personalized wood inlay paddle was a gift from son, Clay. Being outdoors, self-propelled across bodies of water is exhilarating! We have an entire section of our blog dedicated to that SUP Perspective. For anyone reading about the active connection Fran keeps with her local community’s traditions and environmental activities I hope it inspires a local look around. Wherever there is water, wildlife and people there are opportunities to connect and make a difference. You know, thinking back on Fran’s story of her first day SUPing, I don’t think it would have dampened Fran’s enthusiasm one teeny bit if she had fallen in on that first day. She’s got a zesty sense of humor and easily laughs at herself, taking life with a light spirit. While the “elder” in Elder SUP refers to tradition and history around the sport we love, the fact that Fran is 82 does make her “elder” in the calendar sense of the word. Because she treasures and honors the sense of family and connection, she’s a true inspiration. 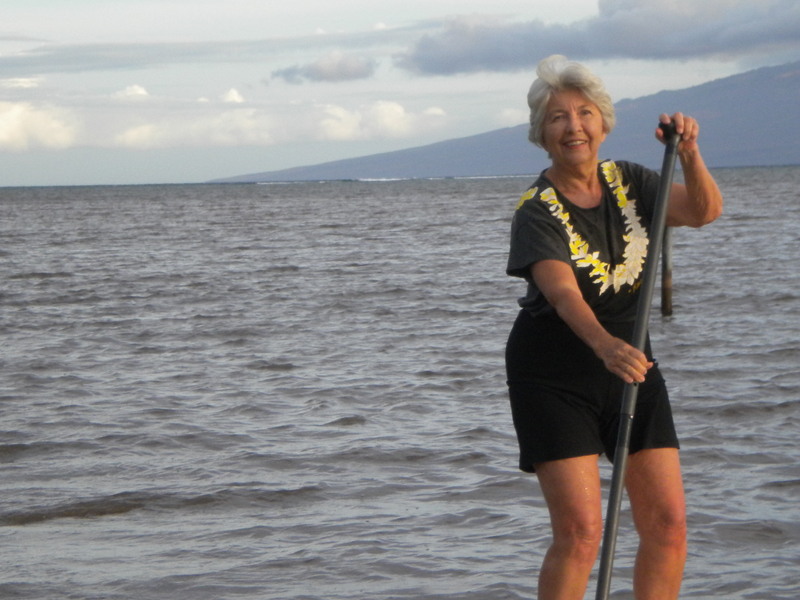 Her paddling story has nothing to do with age and everything to do with attitude. I hope to head to Molokai one day soon and take an SUP cruise in her neck of the sea. 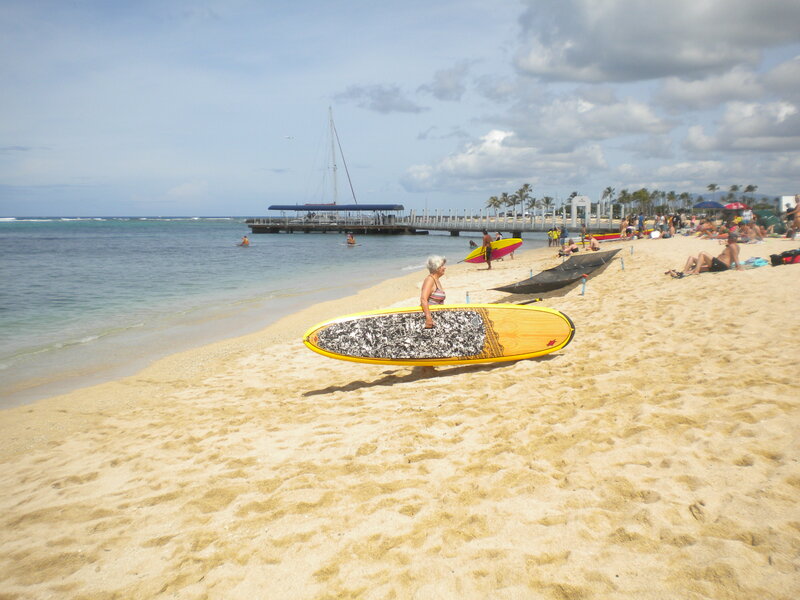 This entry was posted in Hawaii, People, Uncategorized and tagged clay feeter, elder sup, Hawaii, Molokai, Satchel Paige, standup journal, Windsurfing by Water Words. Bookmark the permalink. Reblogged this on People-Powered ExerWellness.